Original Module More or Less for Zend-Loto Lottery. The original Module More or Less for the Zend-Loto lottery from the author. The user specifies the size of the bet, the chance of winning, selects a gap of more or less. A number is generated in advance from 0 to 99,999. If the number is within the range that he chooses, then wins. If he loses, then part of the money goes to the cashier, part to his three sponsors (referrers) and the admin. The module has its own cashier, which does not work in the negative. That is, if the cashier does not have enough money to win, then the user loses so that the cashier replenishes. There is a win sound. There is a switch to the mobile version. The list of recent games is scrolled and updated without reloading the page. It is possible to show the chance of winning in the form of strips and just numbers. It is possible to show and hide game numbers. It is possible to show and hide how much the user has earned. 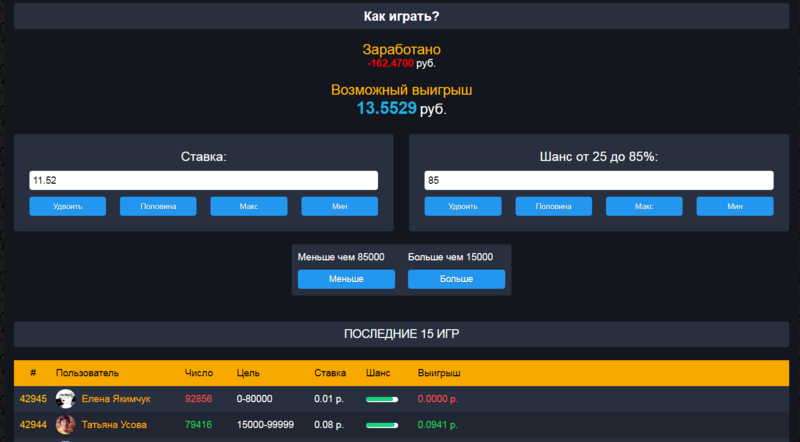 In your personal account you can see how much you set and won. In the admin there are statistics on this module. Installation instructions in the archive.